Being a versatile computer monitoring program, Surveilstar not only support real time screen monitoring, but also support email monitoring and tracking, network monitoring, file and document tracking and controlling, etc. SurveilStar is a powerful and professional realtime screen monitoring program which can help you to capture realtime screenshots and remotely monitor the computers. SurveilStar screen monitoring software can also record all screenshots and save them in database for your further tracking. 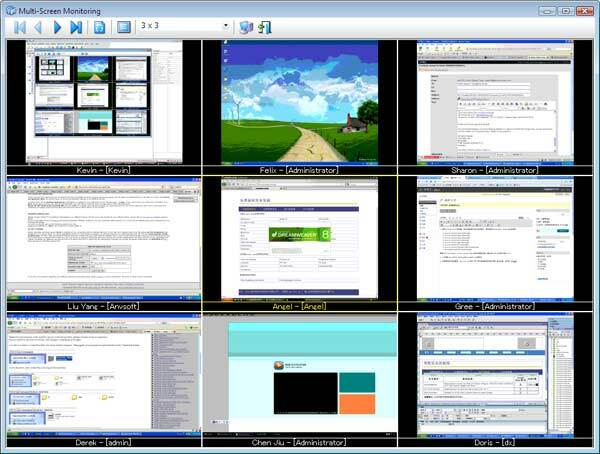 Realtime Screen monitoring is the most direct and efficient way to capture screenshots of the remote computer's desktop or active windows at set intervals. With realtime screen monitoring software, you can easily find out what your kids or employees have been doing on the computer or internet. With the help of realtime screen monitoring, you can keep your kids from internet sexual predators, block indecent material and websites on the Internet and give your kids a safe internet environment. And employers can easily find out workplace slackers and whether the employees obey the company policy. Realtime screen monitoring can even be used to check whether your spouse is loyal. SurveilStar realtime screen monitoring uses client-server model to monitor other computers. SurveilStar realtime screen monitoring includes three parts which are a server, the console and clients. A server is used to store datas including captured screenshots. Microsoft SQL Server will be needed. The console is used to monitor and configure all kinds of settings including multi-screen mode, data keeping day, screen capturing interval, etc. Create an agent with the program and then install it on the computers you want to monitor. Server and console can be installed on one computer or on different computers, and installing multiple consoles is allowed. A 30-day free trial version of this professional realtime screen monitoring software is available. Feel free to download and try to check what your employees and children are doing right now. Multi-screen monitoring mode is very useful when you want to monitor multiple computers. You can view up to 16 computers at the same time. You can divide the employees' into different groups such as sales, customer service, etc and monitor the computers in the same group. Of course, you can monitor a certain computer as you like. What you viewed are realtime screenshots without any delay. Here is an screenshot for 3x3 realtime screen monitoring. Though monitoring multiple computers is useful, you don't need to monitor the screens all the day. SurveilStar can record all the captured realtime screenshots and save in database (.mdf & .ndf) for your further tracking. This is especially useful for tracking business data leak out. It can be used as an evidence once there is a lawsuit. For parents, by viewing the screenshot history, they can know what their kids have done on the computer or internet, and take appropriate action to educate or help the kids. By default, SurveilStar realtime screen monitoring software doesn't record any computers' realtime screenshots because it's taking up free spaces of hard drive. For example, record realtime screenshots on a computer at business time (9:00 - 18:00) every 15 seconds may probably take up 40MB hard disk space. If you have enough free space, it's recommended to record all realtime screenshots. SurveilStar realtime screen monitoring software allows you to record screenshots on working time, rest, weekend, all day or you can customize time as you like. The interval can be also changed according to your request. To record realtime screenshots, you need to create a policy for a certain computer. Different recording time and interval can be set for different computers to meet your need. The captured screenshots can be reserved from 5 to 180 days. Being a versatile computer monitoring program, Surveilstar not only support real time screen monitoring, but also support email monitoring and tracking, network monitoring, file and document tracking and controlling, etc. There is no doubt that SurveilStar will protect business secrets and improve employees' efficiency and productivity for employers, structure a safe internet surfing environment for concerned parents. If you are still looking for realtime screen monitoring software, do not hesitate to download SurveilStar to have a try. 30 days free trial for up to 5 computers is provided! In fact, under most conditions, screen monitoring is legal for employers. In USA, when one of the three provisions is met: one of the parties has given consent, there is a legitimate business reason or the company needs to protect itself, the ECPA (Electronic Communications Privacy Act) allows companies to use screen monitoring software to monitor the employees. Under federal law screen monitoring is usually allowed. In July 2000 legislators proposed the Notice of Electronic Monitoring Act in which employers would be required to notify new employees of any electronic monitoring including screen monitoring and provide annual notice to all employees. Screen monitoring is also widely used by parents to protect their children as guardian. Children's internet protection has become more and more important since more and more underage children are using internet. You can legally monitor your staff with SurveilStar Real-time Screen Monitor.